I don't know if I have ever met someone who doesn't like french toast. I know that there has to be someone out there, but everyone I know does like french toast. And everyone I know that knows about Stuffed French Toast, loves that even more. 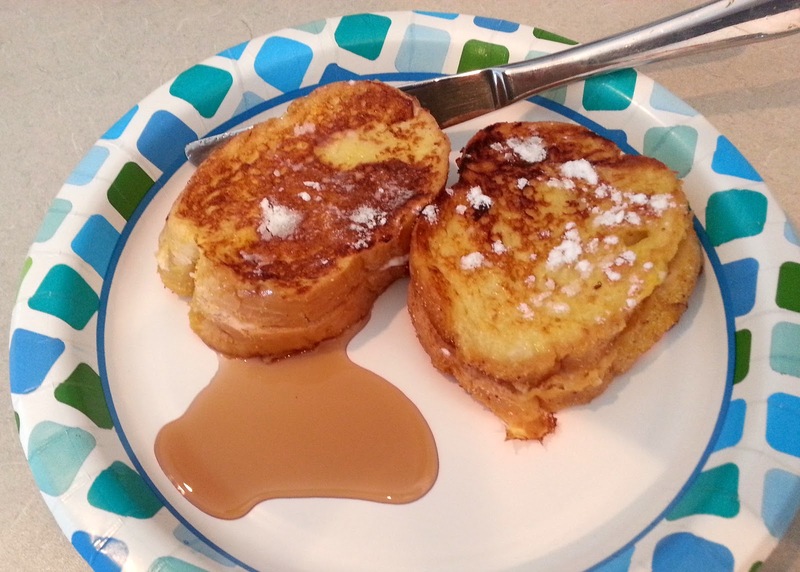 Once again, it's about making the meal special and this takes what is already great about french toast and adds a decadence and elegance to it. I didn't by any means create this dish, but I sure had fun making and eating it. I learned this recipe from a sales rep for Calphalon. She used to make this to demonstrate their non stick pans...coincidentally, I made mine in a Calphalon non-stick pan. These are really customiseable - you can use different breads or jelly flavors. It is really good with jalapeno jelly, but I didn't have that on hand that day. And as you can see, I also was able to use my fine China...aka colorful paper plates. It was the holidays, there was a lot of people, and I had done enough dishes. 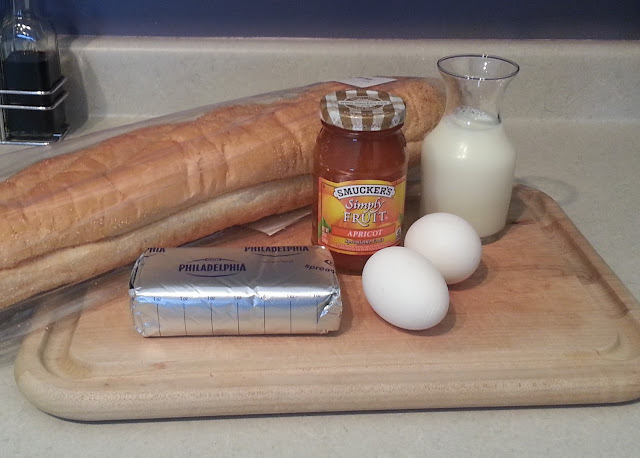 Slice bread into 1/4"=1/3" slices, pairing them off in twos. Spread cream cheese on to one side of the pair and the jelly on the other and close the bread with the cheese and jelly touching. Mix eggs in a bowl and add milk and either the vanilla or almond extract. Heat your skillet over medium heat and brush a little melted butter on the bottom of the pan. 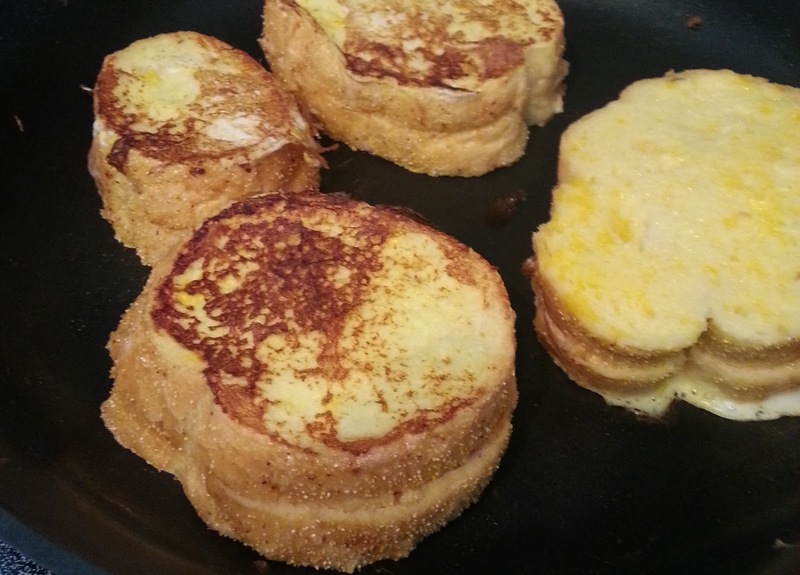 One at a time, submerge your stuffed french toast sandwiches in the egg mixture and place in pan. You can put up to 3-4 pieces of toast in the pan, depending on the size, but make sure that they aren't touching. Cook on the first side for around 3-5 minutes and flip, cooking for around another 3-4 minutes. Store in warm oven until all are finished and serve with syrup, fruit compote or powdered sugar.